Successfully Added World's Smallest Camera to your Shopping Cart. Designed to look like a miniature version of a professional DSLR camera, this awesome miniature camera does still function as a high quality digital video recorder and picture camera- and is guaranteed to attract a lot more attention than its full-size counterpart! We know you like cute things. Like rabbits and butterflies and micro cameras. Well, at least Japanese girls do. Anyhow, if “cute” is your thing then I guess the I95 micro camera could fall into that category. A warning though: keep Tinkerbell away from the camera! You wouldn’t want your cute little Chihuahua to mistake it for a snack and choke on the thing. The I95 delivers a great value considering the same camera is selling right now for $120 on a famous Japanese website. Image quality is on par with our mini DVR and cams in the $50 price range, and for roughly $30 you’ll be quite satisfied with the results. 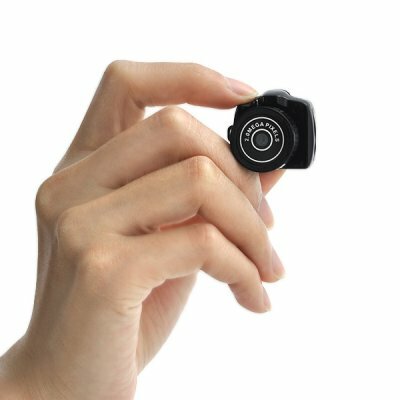 Get one as a memorable and unique gift or keep one on your keychain to capture all of life’s spontaneous moments with the quick press of a button. Important: Keep away from small children as it could become a choking hazard. The camera is tiny & does everything Chinavasion say it does. For £20 it's pretty good value and comes with a 2GB micro SD card. This amazing mini camera is very handy. you can use it for the keyring, or put a lanyard and wear it, add a small ring on it and use it as a bracelet charm, or simply find a new and innovative way to carry it around. it is very convenient for bringing around and taking videos. a lot of people don't believe that it can take photos and videos and are amazed to find the shots posted on a social networking site or blog. i got more orders now for this item after i started using it myself. its a must-buy!